OK. 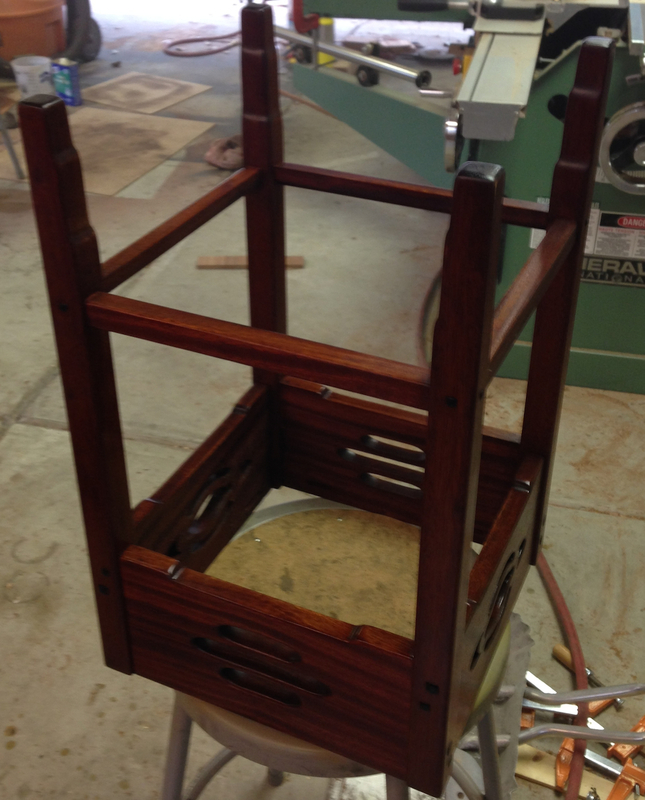 I think I nearly done with the finishing on the Thorsen table. 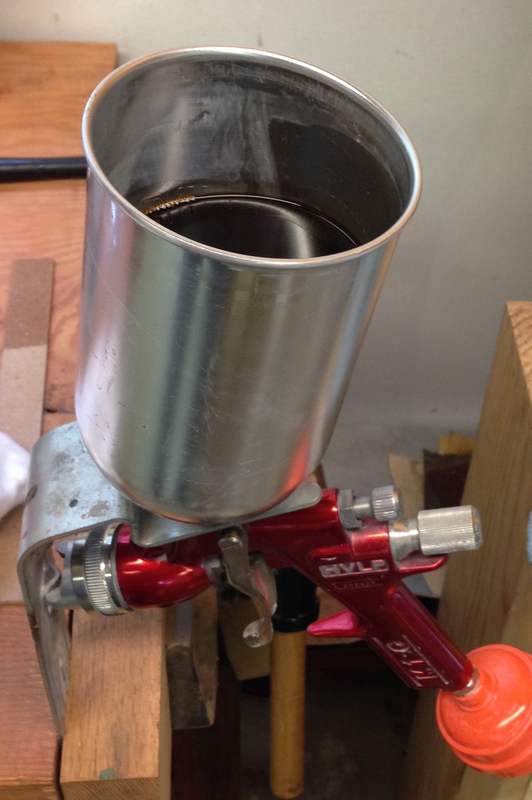 I dug out my old Binks HVLP gun, diluted the same Garnet Shellac I’ve been using , loaded the gun and crossed my fingers. 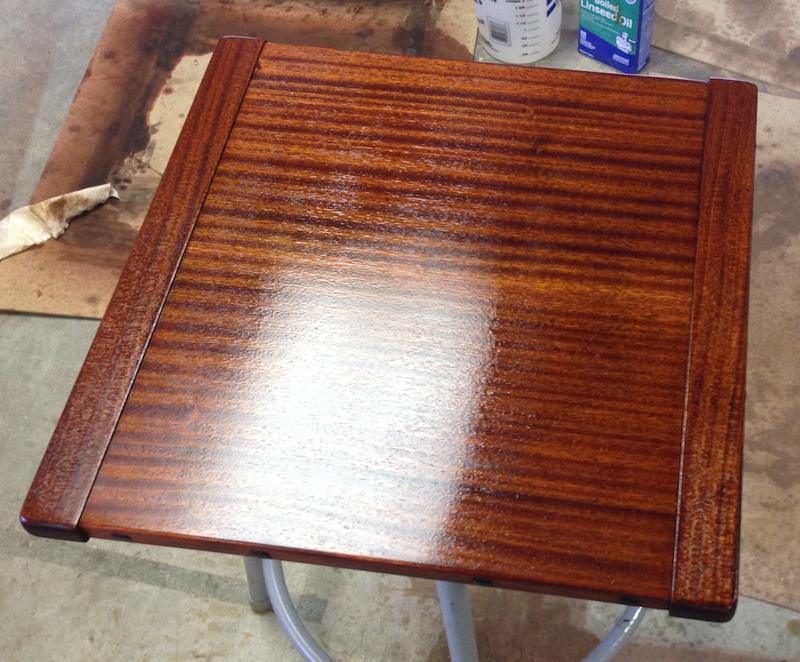 Turns out, compared to spraying high tech catalyzed auto paints, spraying Shellac is pretty simple. I’m guessing I was spraying a mix that was a 1 pound cut or less, I definitely wanted the mix diluted enough that I could spray it without worrying about dark spots if I hit one area with an extra coat. Kind of like spraying candy apple car paint. Before spraying I rubbed the dyed and oiled (and cured) top with a white scotchbrite pad to remove any nibs or oil spots. 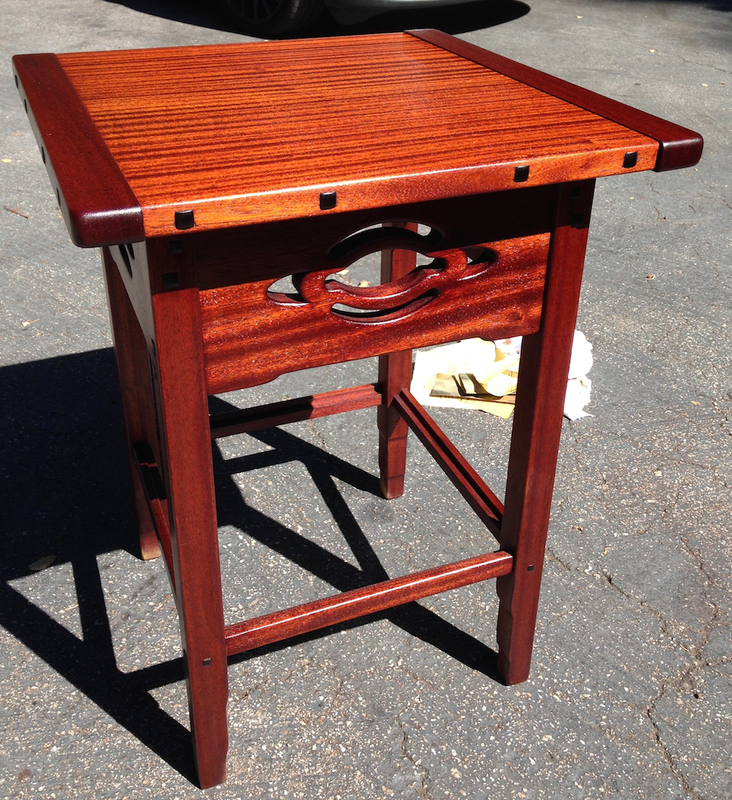 Gently — after rubbing through the finish on the top once I’m not eager to re-do it again. 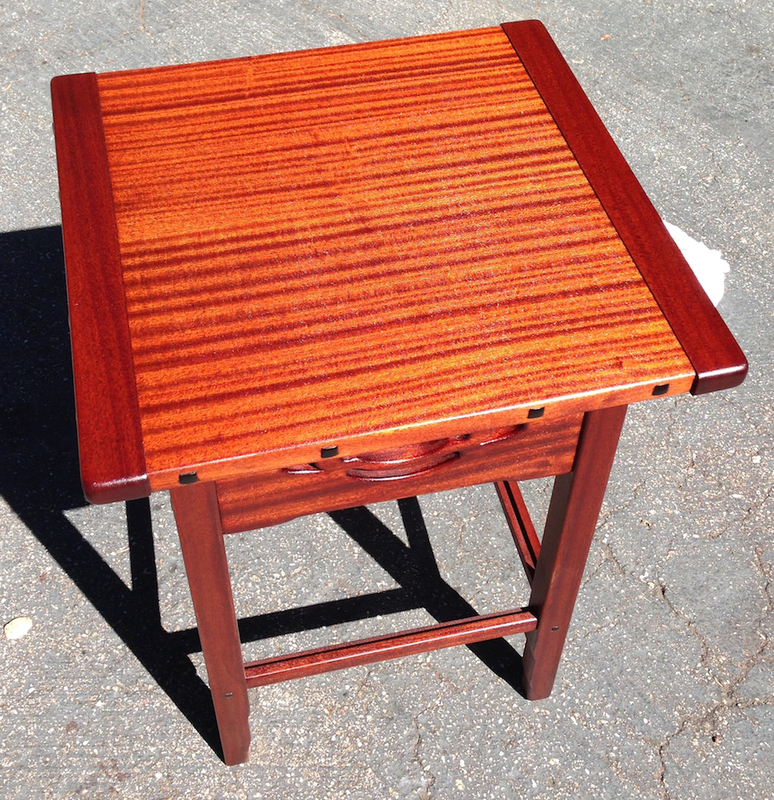 Sapele top has been dyed with Trans-Tint Red-Brown water dye, liberally soaked with Boiled Linseed Oil, wiped dry and allowed to dry for 4 days. 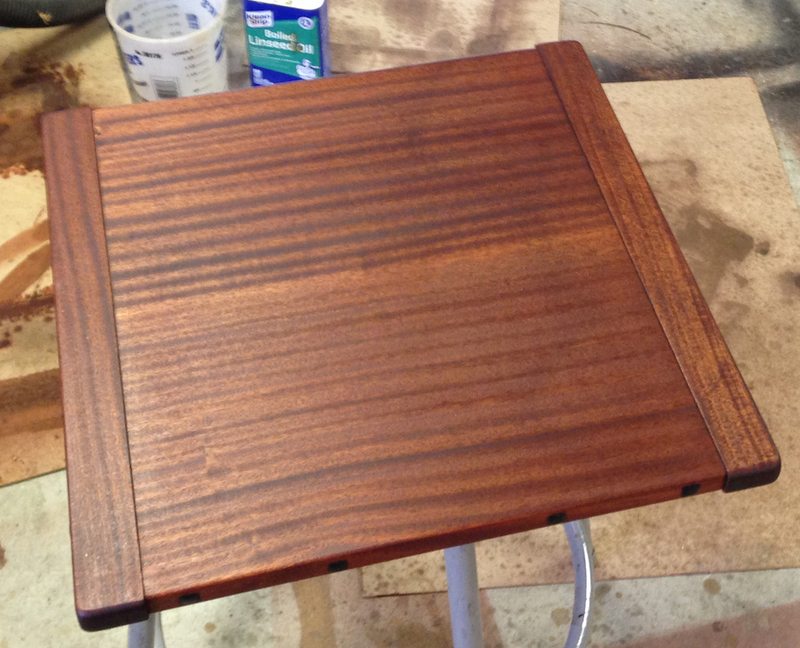 I sprayed the edges first, then did one pass parallel to the breadboard ends, and a second pass with the grain. Then I left it to dry for about 15 minutes. While the top was drying I started sanding out the base with 600 grit, and decided that it could be improved. So after going over the bottom with 600 I shot it with a couple of thin coats too. In the end I sprayed probably 6 thin coats on the top, both sides. I sprayed a double coat, let it dry, and scuff sanded it to remove any roughness. After the first double coat I used 320 grit, after that I just rubbed it with a white Scotchbrite pad. My job right now — and this is probably the hardest part for me — is to leave it alone so it can throughly dry. After that I’ll rub it with 0000 steel wool (carefully) and wax. This will level the finish and add a little more color. In the outside sun the table has a nice red cast. Under the greenish florescent shop lights it looks brown. It will probably be somewhere in between in the house. Is it dry enough to rub out yet? Nope. Wow! Wow! Wow, that looks soooo nice. I think I want to learn how to spray too! Marilyn — it’s way easier than brushing. There are two adjustments (three if you count air pressure) on a gun. Set the pressure. Set the fan width, and adjust the fluid knob to get an even spray pattern without drips when you spray a test piece. Spray so that each pass overlaps the previous one by about 1/3. Watch behind the gun to judge the wetness as you spray. Keep the gun square to the panel, don’t fan it. That’s the gist of it. If you have an air compressor you gan get a superb HVLP gun for $300 or a gun that would probably be absolutely great for furniture at Harbor Freight for $50. Sounds good and I have a pretty big piece that would benefit from spraying .. hmmmm.